For other ships with the same name, see USS Illinois. Illinois served with the European Squadron from 1902 to 1903, and with the North Atlantic Fleet until 1907, by which time it had been renamed the Atlantic Fleet. During this time, she accidentally collided with two other battleships. From December 1907 to February 1909, she circumnavigated the globe with the Great White Fleet. From November 1912, the ship was used as a training ship. She was lent to the state of New York in 1919 for use as a training vessel for the New York Naval Militia. The ship was converted into a floating armory in 1924 as a result of the Washington Naval Treaty, and it was as a floating armory, barracks and school that she served for the next thirty years. In January 1941 she was reclassified as IX-15 and renamed Prairie State so that her former name could be given to USS Illinois (BB-65), a new Iowa-class battleship. Prairie State was ultimately sold for scrap in 1956. Illinois was 374 feet (114 m) long overall and had a beam of 72 ft 3 in (22.02 m) and a draft of 23 ft 6 in (7.16 m). She displaced 11,565 long tons (11,751 t) as designed and up to 12,250 long tons (12,450 t) at full load. The ship was powered by two-shaft triple-expansion steam engines rated at 16,000 indicated horsepower (12,000 kW) and eight coal-fired fire-tube boilers, generating a top speed of 16 knots (30 km/h; 18 mph). As built, she was fitted with heavy military masts, but these were replaced by cage masts in 1909. She had a crew of 536 officers and enlisted men, which increased to 690–713. She was armed with a main battery of four 13-inch (330 mm)/35 caliber guns[a] in two twin-gun turrets on the centerline, one forward and aft. The secondary battery consisted of fourteen 6 in (152 mm)/40 caliber Mark IV guns, which were placed in individual casemates in the hull. For close-range defense against torpedo boats, she carried sixteen 6-pounder guns, also mounted individually in casemates along the side of the hull, and six 1-pounder guns. As was standard for capital ships of the period, Illinois carried four 18 in (457 mm) torpedo tubes in deck mounted launchers. Illinois's main armored belt was 16.5 in (419 mm) thick over the magazines and the machinery spaces and 4 in (102 mm) elsewhere. The main battery gun turrets had 14-inch (356 mm) thick faces, and the supporting barbettes had 15 in (381 mm) of armor plating on their exposed sides. Armor that was 6 in thick protected the secondary battery. The conning tower had 10 in (254 mm) thick sides. Illinois was laid down on 10 February 1897 by the Newport News Shipbuilding & Dry Dock Company of Newport News, Virginia. She was launched on 4 October 1898 and commissioned on 16 September 1901. The ship's first commander was Captain George A. Converse. Illinois was the first member of her class to be authorized, but the last to enter service. After commissioning, the ship began a shakedown cruise in the Chesapeake Bay, followed by initial training. She left the area on 20 November to test a new floating dry dock in Algiers, Louisiana. The ship was back in Newport News in January 1902. She served briefly as the flagship of Rear Admiral Robley D. Evans from 15 to 28 February; during this period, she took part in a reception for Prince Henry of Prussia, the brother of the German Kaiser. On 30 April, now flying the flag of Rear Admiral A.S. Crowninshield, Illinois departed for a tour of Europe. She stopped in Naples, Italy on 18 May; here, Crowninshield took command of the European Squadron. Illinois took part in training exercises and ceremonial duties in European waters for the next two months, until 14 July, when she ran aground outside Oslo, Norway. She had to steam to Britain for repairs, which were carried out at Chatham. She left the port on 1 September for maneuvers with the rest of the fleet in the Mediterranean and South Atlantic. On 10 January 1903, Illinois was reassigned to the North Atlantic Fleet, where she remained for the next four years. Her time was occupied with peacetime training exercises, gunnery practice, and various ceremonial activities. During this period, she was involved in two accidents with other battleships of the North Atlantic Fleet. The first took place on 30 March 1903, when she collided with Missouri. The second collision occurred on 31 July 1906, and took place with her sister ship Alabama. Also that year, Illinois was the first ship to win the Battenberg Cup. The ship's next significant action was the cruise of the Great White Fleet around the world, which started with a naval review for President Theodore Roosevelt in Hampton Roads. On 17 December, the fleet steamed out of Hampton Roads and cruised south to the Caribbean and then to South America, making stops in Port of Spain, Rio de Janeiro, Punta Arenas, and Valparaíso, among other cities. After arriving in Mexico in March 1908, the fleet spent three weeks conducting gunnery practice. The fleet then resumed its voyage up the Pacific coast of the Americas, stopping in San Francisco and Seattle before crossing the Pacific to Australia, stopping in Hawaii on the way. Stops in the South Pacific included Melbourne, Sydney, and Auckland. After leaving Australia, the fleet turned north for the Philippines, stopping in Manila, before continuing on to Japan where a welcoming ceremony was held in Yokohama. Three weeks of exercises followed in Subic Bay in the Philippines in November. The ships passed Singapore on 6 December and entered the Indian Ocean; they coaled in Colombo before proceeding to the Suez Canal and coaling again at Port Said, Egypt. While there, the American fleet received word of an earthquake in Sicily. 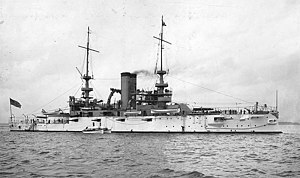 Illinois, the battleship Connecticut, and the supply ship Culgoa were sent to assist the relief effort. The fleet called in several Mediterranean ports before stopping in Gibraltar, where an international fleet of British, Russian, French, and Dutch warships greeted the Americans. The ships then crossed the Atlantic to return to Hampton Roads on 22 February 1909, having traveled 46,729 nautical miles (86,542 km; 53,775 mi). There, they conducted a naval review for Theodore Roosevelt. On 4 August 1909, Illinois was decommissioned in Boston. The ship then underwent a major modernization, receiving new "cage" masts and more modern equipment. She spent the next three years in active service with the fleet, before being decommissioned once more on 16 April 1912. She returned to service on 2 November for major training maneuvers with the Atlantic Fleet. Illinois made training cruises to Europe with midshipmen from the US Naval Academy in mid-1913 and 1914. By 1919, she had been decommissioned at the Philadelphia Navy Yard. On 23 October 1921, she was loaned to the New York Naval Militia for training purposes. The 1922 Washington Naval Treaty, which mandated significant reductions in naval strength, stipulated that Illinois must be rendered incapable of warlike action. As a result, she was converted into a floating armory at the New York Navy Yard in 1924 and was assigned to the New York Naval Reserve. On 8 January 1941, the ship was reclassified from BB-7 to IX-15, and was renamed Prairie State[b] so that her name could be used for the new battleship Illinois, which would be laid down a week later. Throughout World War II, she served with the U.S. Naval Reserve Midshipmen's School, based in New York. After the end of the war, Prairie State was kept as a barracks ship for a Naval Reserve unit. On 31 December 1955, the old ship was stricken and subsequently towed to Baltimore, where she was sold for scrap to the Bethlehem Steel Company on 18 May 1956. ^ /35 refers to the length of the gun in terms of calibers. A /35 gun is 35 times long as it is in bore diameter. ^ "Prairie State'" is the nickname of the state of Illinois. ^ a b c d Gardiner, p. 142. ^ a b c d e f g h i DANFS Illinois. ^ a b c Silverstone, p. 9. ^ a b Albertson, pp. 57–66. Albertson, Mark (2007). U.S.S. Connecticut: Constitution State Battleship. Mustang: Tate Publishing. ISBN 1-59886-739-3. Gardiner, Robert, ed. (1979). Conway's All the World's Fighting Ships: 1860–1905. London: Conway Maritime Press. ISBN 978-0-85177-133-5. Jones, H. G. (2010). The Sonarman's War: A Memoir of Submarine Chasing and Mine Sweeping in World War II. McFarland. ISBN 978-0-7864-6003-8. "Illinois". Dictionary of American Naval Fighting Ships. Naval History & Heritage Command. 3 April 2014. Retrieved 27 June 2015. Silverstone, Paul H. (2013). The New Navy, 1883–1922. New York: Routledge. ISBN 0-415-97871-8. Alden, John D. (1989). American Steel Navy: A Photographic History of the U.S. Navy from the Introduction of the Steel Hull in 1883 to the Cruise of the Great White Fleet. Annapolis, Maryland: Naval Institute Press. ISBN 0-87021-248-6. Friedman, Norman (1985). U.S. Battleships, An Illustrated Design History. Annapolis, Maryland: Naval Institute Press. ISBN 0-87021-715-1. Reilly, John C.; Scheina, Robert L. (1980). American Battleships 1886–1923: Predreadnought Design and Construction. Annapolis, Maryland: Naval Institute Press. ISBN 0-87021-524-8. Taylor, Michael J.H. (1990). Jane's Fighting Ships of World War I. Studio. ISBN 1-85170-378-0. Naval History & Heritage Command photos of the USS Illinois (Battleship # 7, later BB-7), 1901–1956. Later renamed Prairie State and designated IX-15.